One of my favorite movies , and words, of all times is “Serendipity.” The word means: the discovery of something pleasant, fortunate by chance, fate, destiny, luck, coincidence… however you choose to describe it. When I discover something which causes me to smile and to have a feeling that it was meant for me to find, I wonder what special force or energy, which spirits or angels are guiding me to objects that lead me closer to a knowing, closer to a belief that there is something much greater than ourselves at work in our human lives. This is what I call gaining The Inside Advantage. 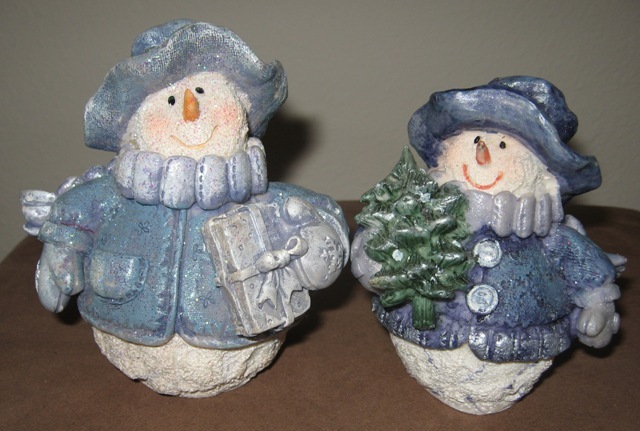 The little snow-woman (on the right) was a gift from my mother many years ago. I put it on display at Christmas every year as I think of her. Just before last Christmas I was visiting a local thrift shop. To my delight, I saw this little matching snowman; I laughed out loud and had a tear in my eye at the same time. Of course, I bought it and took it home to set beside his soul mate. Maybe Daddy sent me to the shop that day so I’d have both of them together from now on. He’s still sharing love and making me smile. Thanks, My Precious One! I invite you to visit my website blog at CWLauro.com to learn about an even more special discovery I made — one that offers comfort and peace of mind, including a wonderful, heart-warming poem. This entry was posted in Spiritual Journey and tagged Cathy W. Lauro, celebrating life, changing your beliefs, coincidence, fate, feeling better, finding joy, inspiration, living deeply, luck, serendipity, spiritual journey, The Inside Advantage. Bookmark the permalink.